New Horizons is ready to put another planet – or at least the planet’s orbit – in its rearview mirror. The Pluto-bound spacecraft crosses the path of Uranus around 6 p.m. EDT on March 18, more than 1.8 billion miles from Earth. New Horizons is headed for a rendezvous with planet Pluto and its three moons in July 2015 and, soon after, possible encounters with smaller bodies in the distant Kuiper Belt. 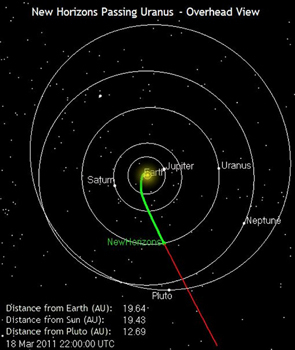 The fastest spacecraft ever launched, New Horizons has already covered serious space since lifting off in January 2006 — traversing 20 times the distance between Earth and the sun, including a flight through the Jupiter system in 2007 for a gravity-assisted speed boost and scientific observations of the giant planet and its largest moons. 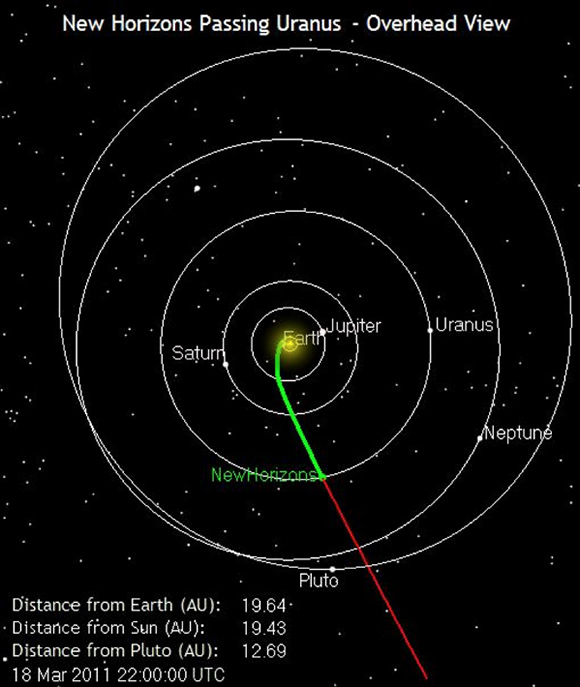 When has New Horizons passed the other planetary orbits? Check here. No pictures of Uranus are planned — the gas giant is 2.4 billion miles from New Horizons and the spacecraft is currently in electronic sleep mode — but the mission team on Earth is busy enough, putting final touches on its Pluto-encounter plan and, in April, starting a search for potential flyby targets in the Kuiper Belt. Preparations are also under way for the annual spacecraft systems checkout this spring. Next planetary milestone on New Horizons’ voyage is the orbit of Neptune, which it crosses on Aug. 25, 2014 — exactly 25 years after Voyager 2 made its historic exploration of that giant planet.